Karen Kroon and Rokket win the Abu Dhabi Arabian Nights CEI*** event in a course record time of 7:57. Best Condition for the event was awarded to Rokket as well. The event had 53 starters in both the FEI and AERC Open divisions. The FEI division completed an impressive 71% enterants. The overall event completion rate was 66% with no metabolic pulls and no equine treatments. Second place in the event went to Suzanne White Hedgecock riding AA Montego. Third place was won by Valerie Kanavy riding Shahdon. Shieka Madiya Al Maktoum on My Rainbow Jasper also completed the 100 mile event in the Idaho desert to achieve her first 100 mile completion! 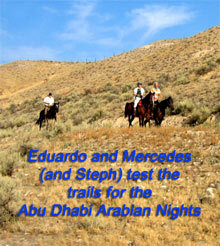 60+ entrants are expected to test their skills in the 2004 Abu Dhabi Arabian Nights Endurance Race on Saturday, 28 August at the southern Idaho ranch of John and Stephanie Teeter. 46 are entered in the CEI*** event, with 14 in the concurrent AERC open event. Ride Manager Stephanie Teeter says, "We expect a very competitve 100 mile event this year. The weather is cooling and clear with perfect trails". The USEF Endurance Squad will be participating in preparation for the 2004 World Endurance Championships to be held in January in Dubai U.A.E. The Emirates International Endurance Village, sponsor of this years event, are providing prizes for the top three finishers as well as for the horse judged to be the Best Condition. The first place finisher will receive a Sundowner horse trailer. Second place will receive a Gaston Mercier saddle. Third place will receive a Specialized Saddle. The Best Condition award will be a Reactor Pannel Endurance Saddle. Compiègne is going back this year to the legendary 100 miles, the best distance for endurance riding. It will be one of the latest FEI qualifications for The Worldchampionship in Dubaï 2005. The idea of a 7-8 years old horses Worldchampionship has to develop itself this year. Foreign nations and foreign riders should be more numerous than last year to compete for a title dedicating to the best young horses around the world. With 40 miles of the 100-mile race behind them, Richard Frazier anticipated riding his white Arabian stallion Hindi Shahab across the finish line. And maybe, as in several past horse-and-rider events, they?d be leaders of the pack. But that hope wasn?t to be. After high-altitude training in Otero County?s Sacramento Mountains to prepare for the Tevis Cup in Lake Tahoe, Calif., Frazier and his white Arabian stallion withdrew after an injury. ?We had finished the most difficult section of the race, which was the climb of 8,750 feet over Emigrant Pass, and had crossed the 20 miles of humid bogs through a National Wilderness area,? Frazier said. ?I thought we were in great shape as the metabolic part of the vet(erinarian) check showed the stallion?s vital signs perfect with no stress.? The FEI asked for the views of the National Endurance Federations on each of the above mentioned items by the 31st July 2004. As some of the Federations communicated/ discussed this matter between them, I had the opportunity to read several proposals. I got the feeling that the FEI Endurance Committee will have some difficulties to find a consensus because of the wide variety of ideas and wishes. Dawn bleached shadows off the Sierra's granite bones as horses in the Tevis Cup Ride trotted from the forest and into Squaw Valley. Once on an open cat road, they cantered, tails raised, manes flying, muscles rippling in sleek haunches, and romped uphill to High Camp. Many wilderness miles away to the west awaited a finish line, in the foothill town of Auburn. A SUPERB ride by Shaikh Daij bin Salman Al Khalifa of Al Taleeya Stable and Hamad Al Muresi of the Royal Endurance Team earned them spots in the World Championship in January next year in the UAE after finishing the 160-km Hilton Herbs Alfred's Tower endurance festival at the National Trust Stourhead Estate in Warminster, Wiltshire. Khalid Al Rouwaei, who also completed his second 160-km race on Najib Du Bernoud, will need to finish one more race to qualify for the World Championship. At 5:15 a.m. last Saturday, Ken and Betty Wolgram of Craig set out on horseback to conquer 100 miles of trails over the Sierra Nevada mountains. 23 hours and 55 minutes later, just five minutes before the deadline, Ken crossed the finish line. Betty came in 50 minutes later. SHAIKH Daij bin Salman Al Khalifa from Al Taleeya Stable is on course for a spot in the World Endurance Horseride Championship in January next year in the UAE after completing the fifth stage of the 160-km Hilton Herbs Alfred's Tower endurance festival at the National Trust Stourhead Estate in Warminster, Wiltshire, England. Italian Nation's Cup CEIO in Gubbio Perugia, Italy - September 17. Lynn Lopez in USEF Athletes Services - 908-234-0848. As Show Jumping has the CSIO so Endurance now has the CEIO - the Official International Endurance Contest. This important format for events, which in the world of Show Jumping is limited to the official teams of the various national federations who compete in the famous Cup of the Nations, is extended for Endurance to include individual competitors who are given a final ranking. After the first CEIO event in the history of Endurance, which took place at La Baule in 2003, this year Endurance has for the first time a fixture list with a circuit of three Official International Competitions. The first of these took place in La Baule on 8th May 2004, the second in Newmarket (GB) on the 27th June and the final will be held in Gubbio ( Italy ) on 18th September . September 24-26, 2004: Test event for the 2006 WEG in Aachen, Germany. USA riders interested in attending: contact Lynn Lopez in Athletes Services - (908) 234-0848. The 2005 Pan American Endurance Championship will be held in Pinamar, Argentina on April 2, 2005. As notification of this event was received relatively late and because there will be little or no funding available from USEF, the Endurance High Performance Committee has decided to modify the existing Criteria to Compete Abroad in order to select a team to represent the United States at the 2005 PAC. The following is a draft only. When the USEF Executive Committee has approved this criteria, it will be distributed by mail and will be available on the USEF website. The final version may be differ slight in the details but not in substance. 1. Be a US citizen or in compliance with FEI Article 123. 2. Be a current member of AERC. 3. Be a current member of AERC International. 4. Be a current member of USEF. 5. Have completed a minimum of 500 verifiable lifetime AERC or equivalent miles in endurance competitions at distances of 50 or more miles. 6. Have completed at least two, 100 mile, one day rides. First Preference: Members of the existing National Team who are willing to take their own horse. Traveling Squad members to be ranked in order of completion; non-Traveling Squad members to be ranked by the USEF Endurance Credentials Committee. Second Preference: The top 10 finishers from the most recent Pan American Endurance Championship who are willing to take their own horses ranked by order of finish. Third Preference: Any rider who meets the eligibility requirements who is willing to take their own horse, ranked by the USEF Endurance Credentials Committee. Fourth Preference: Any rider who meets the eligibility requirements who wishes to lease a horse, ranked by the USEF Endurance Credentials Committee. All riders and horses must have earned an FEI Certificate of Capability for this event (See FEI website: www.horsesport.org). The USEF Endurance Credentials Committee may consult with the existing USEF National Selection Committee when determining their rankings and determinations. Belgian rider Leonard Leisens vows "I will return!" Leisens will be competing in Oreana, Idaho again this summer, representing Belgium at the 2004 Abu Dhabi Arabian Nights CEI***. 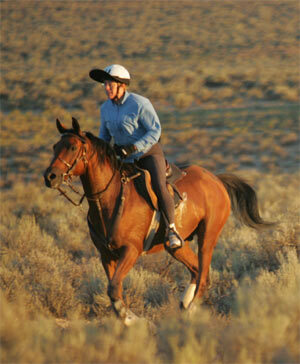 Leisens is no stranger to the Idaho desert, having ridden the Owyhee trails of Idaho on three previous occasions. His accomplishments include 4th place at the 2003 CEI*** Pacific South (Oreana, Idaho) ride on Great Santini, and several successful rides at the Owyhee Canyonlands multiday ride. But Leisens, a top ranked FEI rider, still remembers the day when he lost a top ten finish on Jaziret Bey Musc, as he pursued two top women riders through the Idaho desert badlands, only to find that they had taken the wrong trail... "I thought that the trail might be wrong, and I kept racing to catch them and ask them - but they were going very very fast!". 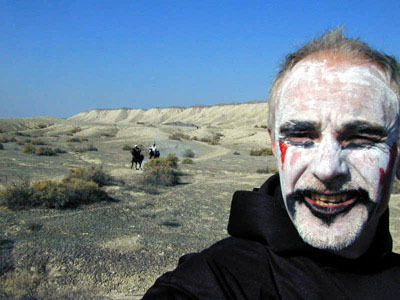 Now Leisens will return to the desert and try his luck again, vowing to keep his focus and redeem his reputation. On August 28, Leisens and other riders from around the world will be gathering in Idaho to test their skills and keep their cool at the Abu Dhabi Arabian Nights 100 mile, CEI*** Endurance event. 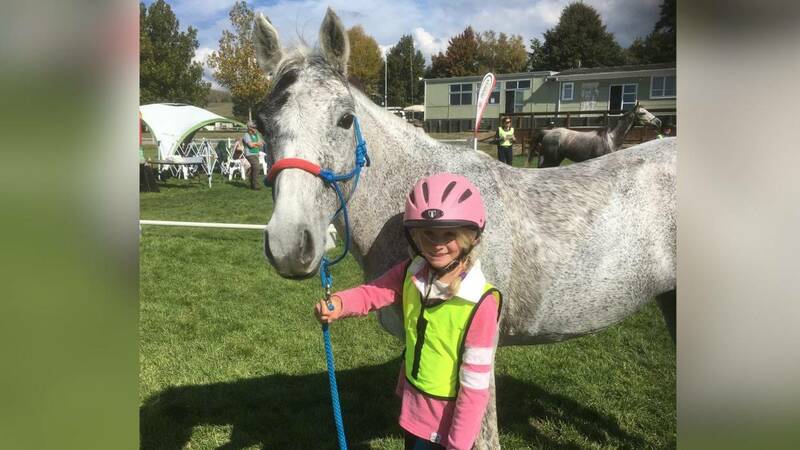 RIDING 80 kilometres in an endurance ride on a horse doesn't bother Jessica McKeown ? it's carrying her saddle after the ride that is the hard part. "Sometimes, people offer to carry it for me, and I always let them," said Jessica. At 10 years old, Jessica is the youngest qualified endurance rider in Western Australia, and is in the top 10 in National points scores in Australia. "Jess can ride as well as any adult, and she understands her horse," said her trainer and father, Alistair. Endurance riders from 5 continents will be participating in the Abu Dhabi Arabian Nights Endurance Ride located for the first time in Southwest Idaho on August 28, 2004. Top equestrians from United Arab Emirates (UAE), Brazil, Argentina, Japan, Canada and the United States will begin to arrive in mid-August at the Owyhee ranch of John and Steph Teeter, hosts and organizers, to compete against each other, and against the elements. Armed with a 23-member crew of security personnel, horse trainers, a physiotherapist, a veterinarian and a physician, His Highness Sheikh Khalid Al Nahyan is set to deal with any surprises as he rides his horse through rough terrain. "It's something traditional," said the 17-year-old from the United Arab Emirates about riding horses. "You know, when your dad and your grandparents own horses, it is natural." In the history of the Arab world, horses have been bred for centuries and used for hunting and fighting. Al Nahyan was one of 100 riders from across North America to saddle up his horse for the four-day Canadian/Arabian Horse Association National Endurance Championships at Sprucewoods Provincial Park, located 80 kilometres southeast of Brandon. Twenty-two riders took part in yesterday's 24-hour endurance race spanning 165 kilometres.